There is probably few subjects more likely to incite parental passions than that of securing school places. If you care about your kids, the chances are you are going to care about which school they go to. A lot. Which makes it all the more puzzling why successive governments have gone out of their way to devise a system for the planning and provision of school places that appears to be structurally and functionally completely broken. In the old days Local Education Authorities, (LEA’s now LA’s), used to look after all schools in their county, including the building of new schools and expanding existing ones. They would work in tandem with local District Authorities who would be responsible for approving the planning for new local housing which might drive demand. For whatever reason, successive governments, both Labour and Conservative decided that they didn’t like that system, or at least that being the only system in town. They favoured policies around parents having more choice of the kinds of school they could choose, the ability for schools to free themselves from from local authority control, and created opportunities for parents, faith groups, charities and even companies to get involved in establishing new schools. In short, the academisation of schools. The idea is very popular with some, hated by others. The merits of which is a debate for elsewhere. The focus of this piece is about how those policies have impacted the overall system for planning and providing school places. There is, in essence, a complete breakdown between the relationship between demand and supply. A national baby boom in the early 2000’s. This meant there were half a million more pupils in the system last year than in 2009, and the numbers are set to continue to rise pretty sharply. Local population/demographic shift as a result of house prices. So in our area, Brighton is one of the least affordable places in the UK for first time buyers. So if you are starting a family and want your own home, the chances are you will look to the slightly cheaper satellite towns. My town, Shoreham is one such town, and this has meant that up to 40% of the school age population has come from outside of the area. What we call Brighton/London ‘drift’. The local district authorities weird planning remit. They have responsibility for giving planning approval for new homes. BUT, they have next to NO control over the numbers of houses to be built. This is because the government sets a national target for building homes. It splits that number up between the local councils and tells them thats their number. So for Adur where we live that is approximately 4-6000 more homes to be built between now and 2030. Now everyone agrees that more houses need to be built. People are living longer, the breakdown of the nuclear family, population growth, and so on has contributed to a surge in demand. BUT, what is less known is that they have to meet those numbers REGARDLESS of whether there is the infrastructure to support it. Yes that’s right, not having enough schools or roads is not a legitimate reason to push back on housing targets. AND that infrastructure is not their responsibility anyway. Responsibility for providing new school places belongs to the County authority. So on the one hand, you have a lot of factors and institutions generating school places demand. But no means of supply. Now here’s where it gets super stupid. 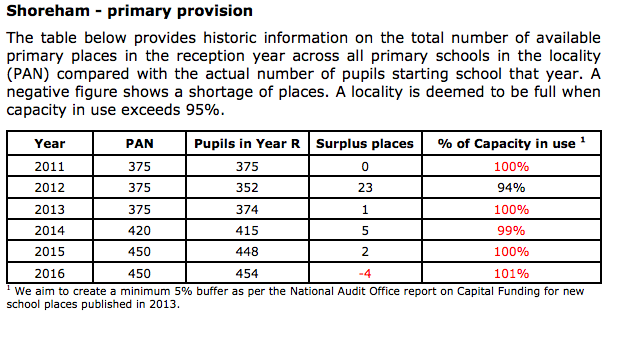 So local county authorities such as West Sussex, do have the responsibility for supply/provision of school places. BUT have no authority to build new schools. What most parents don’t know is that ALL new schools have to be Free/Academy Schools, and these are outside of local authority control. The councils can try and source land from local developers, but they cannot build. The only people who can open new schools are parent groups, other academies, faith groups, other academic institutions, basically anyone other than the local councils. And the only people who can approve new schools are sitting in Whitehall at the Dfe. So county councils, (LA’s), only have one trick in their playbook to deal with capacity issues, and that’s to expand existing schools. That is why nearly every school in our area has expanded the number of classes, pretty much regardless of whether it is appropriate for that school or site. To illustrate this point my kids school site was designed as a one class per year infant school i.e. 3 classes total. It’s now a 2 class per year primary, with one (possibly more) 3 class ‘bulge years’. So now 13+ classes on a site designed for 3. Or put another way 448 pupils instead of 90. This has potentially a number of serious consequences. Such as lack of play space, quick turn around lunch sittings which are not great for slow eaters, huge logistical issues arranging multiple assemblies, concerts and so on. And as the increase in school population approaches secondary school, they too have reached capacity, meaning a significant and growing number will not be able to get into their preferred local school. And yet, despite local schools warning about this for many years, as of yet no new schools have been built. Now someone could open a free school/academy, and indeed one local primary academy is trying to do just that. The problem with that process is that the decision is not made locally, it depends fairly arbitrarily on someone being bothered who probably has another main job, it may mean they are not necessarily in the right place, and there can be little coordinated local long term planning or provision. The other big issue is data. Although county councils are obliged to do some planning based on data. In our experience, the data is not up the job. For example, it they rarely take into account population drift, they don’t join up data with nurseries and pre schools, (we have been told for reasons of data protection), and use formulas of school places per new dwelling that is at best conservative. So you have one half of the system generating huge demand, but no means of supply. Then the other half that is tasked with supply that can only expand, but cannot build new schools. This leaves us with planning system for both which is not joined up, or strategic, in any sense. And this feeds into creating a system that is woefully unprepared to meet demand, and results in knee jerk, short term fixes, pushing more and more kids into already squashed spaces, when what is needed is a long term, measured, and planned approach. So what can be done? The government knows there is a problem on the capacity. A 5th of all primary schools are full, and 15% of secondary schools. 32% of pupils in London did not get their first choice school. The government has just allocated £320m for 140 new schools, and 70,000 new places over the next few years. However, when you discover that London alone has a need for 110,000 more places in the next five years, then you realise that is simply not enough. Add to that the broken planning and provision process. Add to that a stated desire for selective schools being added to the mix, and you start to find more and more barriers being put in the way to a solution. Support a change in national policy allowing local councils (district and/or county) to be able to open new schools. This simple change would overnight align resources, planning and infrastructure. Start a new free school. Not for the feint hearted. But it is possible. Support proposals for new free/academy schools. Find sponsors and partners for new schools, whether that be other academies, education institutions, or faith groups. And try and get developers, councils, schools and parents working together to find some solutions. Any other suggestions to fix this broken system welcome.